I was looking at microfilm at the library and made an interesting discovery. You’re looking at the movie section of the Chicago Daily Tribune from Saturday September 21st, 1929. Four theaters in the Chicago area were playing a Laurel and Hardy “talking skit”. Here’s a closer look. Just what is this “Talking Skit”? Sure, it could be anything, but the theaters appear to have labeled it “Just Like A Man”. As far as we know, there never was a Laurel and Hardy film released with that title. Could this be an unknown treasure? Perhaps this is a long lost, forgotten film that somehow disappeared. 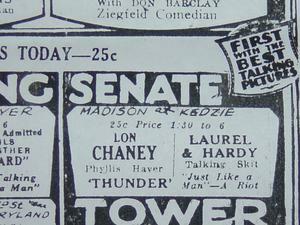 While we’re on the topic of lost films, the Lon Chaney picture next to it, “Thunder”, is presumed missing. This MGM release was Chaney’s second to last picture and only a few minutes of it survive. 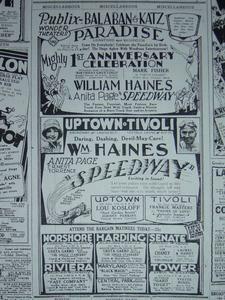 Go to www.missingfilm.com to see my website devoted to theatre ads for films that are presumed lost. I always loved “From All of Us to all of You” when it pleyad almost every Christmastime on Disney’s Sunday night show during my youth. Happily, from 1978 onwards when I had my first VCR, I was able to tape it whenever it ran. While the NBC version at 7 PM would only run a new film excerpt as the “special gift” if Disney had a new Christmas release (otherwise they would run a short cartoon), CBC at 6PM would often run shows that had been originally broadcast years before. Therefore I was able to get the shows that were promoting “The Jungle Book” and “The Aristocats” years after those films had debuted. Keeping in mind that this was well before these films were eventually released on home video, having some clips was pretty exciting! See “Stan & Ollie”, a major motion picture starring Steve Cohan and John C. Reilly!